What Do You Really Need to Know About Selling Your House? 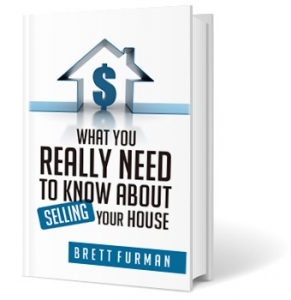 For a homeowner thinking about putting your house up for sale, there is no more valuable volume around than Brett Furman’s book. Brett’s 28 years of experience in real estate and his innovative approach to home-selling make this book a veritable goldmine of strategies, tips, and insights that educate you about the real estate market, then put money in your pocket when the time comes to sell your home. Selling a home is not as simple as just hiring an agent and getting a property listed. First of all…how do you find the right agent? How is your home going to be marketed differently than every other property listed for sale? And how do you know what your home is worth, and when is the right time to list? 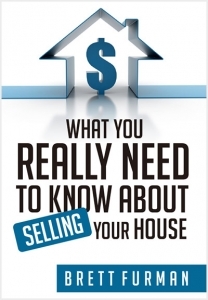 In Brett’s book, What You Really Need to Know about Selling Your House, Brett applies his mastery and understanding of the real estate market and breaks down the process of preparing a home and marketing it for sale in easy-to-understand, step-by-step methodology. 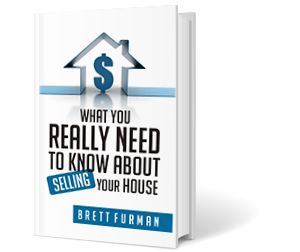 No matter which real estate agent you choose, and no matter the style or size of the home you’re putting on the market, Brett Furman’s What You Really Need to Know about Selling Your House will be an educational, helpful guide overflowing with information that you simply won’t get anywhere else. Brett shares his systematic approach towards a successful home sale, which means a sold sign AND a positive experience plus money in the bank for you! Selling a home is not as simple as just hiring an agent and getting a property listed. Fill out the form below to request your copy and discover the inside secrets on what REALLY makes a home sell.